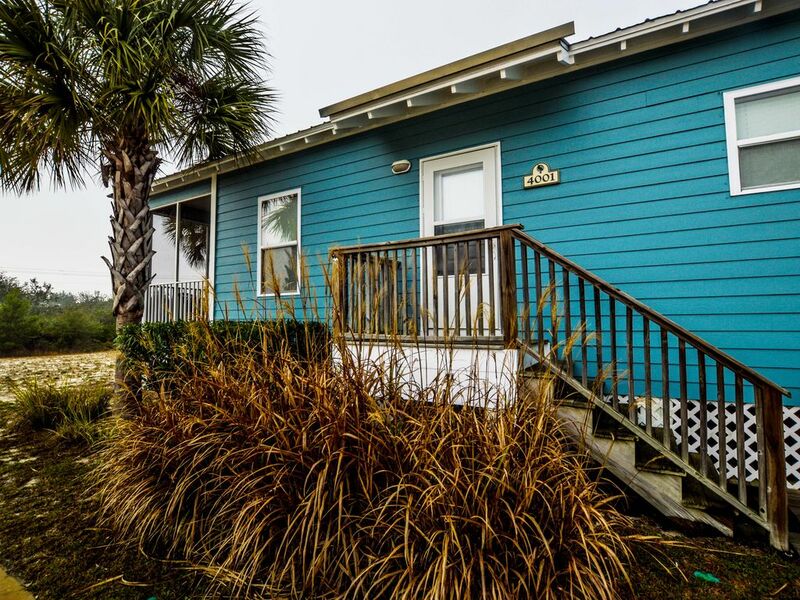 Use code SPRINGFUN2019 & save $$ online~Cute Cottage~Beach Access~2 pools! This three bedroom/ two bath unit offers plenty of room for your vacation. The large kitchen is stocked with all the cookware needed for lunch or dinner. The living room has a sleeper sofa, flat screen television, and DVD player. The Master Bedroom has a king bed, flat screen television, and private bath. The two guest bedrooms offer: Bedroom 2 has a Queen Bed with flat screen television; Bedroom 3 has a Twin bunks built into the wall with 2 Full beds below. It also features a flat screen television & DVD. Both guest bedrooms share a spacious bathroom. Upon check in only one key was available in lock box. Could not find other in house. I called to let hem know so I would not be charged $35. But we did find it later on floor under sofa 2nd day there. Floor upon arrival was dirty and the glass table was dirty. The chairs for dining table are all stained and gross. The sheets in the master bedroom had some stains on them. First off the communication with Pat was always very responsive. She always answered all my questions and concerns before and during the stay. I could also tell when it was not Pat that was responding. They were very short and not to informative. My family stayed for 5 days and we had a wonderful time. The house was very clean and spacious. There were 10 of us and it was the perfect setup for a large family. Every room had a flat screen TV and Direct TV. Everything you could possibly need is provided. We will definitely be coming back. This unit was very clean. I am picky about cleanliness and it exceeded my expectations. The decor was cute and there was plenty of space. The kitchen had everything we needed except the blender leaked so we couldn't use it. There was a beach access very close within walking distance although we decided to drive and parked there. The pool was nice but didn't match the photo shown. There was plenty of water for all of us to take hot showers every day. It was so nice to have a washer and dryer. I will always rent this place! Very nice! Five stars!!! The house was very clean, roomy, and inviting with many amenities to support all of the beach excursions to come. It met all of our expectations. We had a great time at our stay and would definitely recommend to anyone wanting to vacation here. It's a come back - we enjoyed it very much.